Particle & Surface Sciences have announced that virus particle detection and counting using Nanoparticle Tracking Analysis is providing essential information for researchers at the University of Strathclyde’s Institute of Pharmacy and Biomedical Sciences (SIPBS). This team develops methods to employ naturally-occurring bacteriophages to combat MRSA and other bacteria. 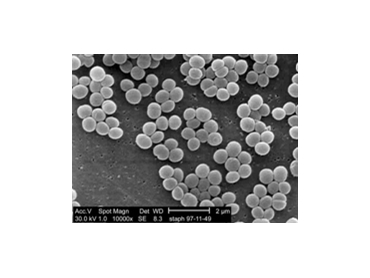 MRSA or Methicillin resistant Staphylococcus aureus is a variation of the bacterium Staphylococcus aureus, which has developed resistance to most antibiotics making it difficult to treat and potentially deadly. Whilst the ‘Superbug’ can be killed with detergents, detergent dilution and application is often inconsistent and ineffective, hence the bacteriophage route. It is in characterising bacteriophage cultures that NanoSight comes into play, employed within a team lead by Dr Mike Mattey, honorary lecturer at SIPBS. Prior to deploying bacteriophages as a dry-coat to protect high-risk bacterial invasion sites (sutures, instruments and wounds), the cultures need characterisation and their concentration needs assessing. NanoSight allows the team to view and size viral cultures rapidly, in real time and at low cost. The characterisation of virus populations requires assessment of aggregation in the 20nm to 1,000nm range. NanoSight provides fast and easy quantitative sample characterisation that is not possible with other methods such as the Beckman Coutler DLS, plaque assay and SEM. Additionally, NanoSight’s technology provides a reassuring view of the particle population that supports the counting results. The NanoSight LM system uses a novel employment of laser light scattering. These instruments visualise and dynamically size populations of suspended particles on an individual basis down to a particle size of approximately 20nm, dependent on the material. NanoSight directly tracks the Brownian motion of each and every particle separately but simultaneously, using a CCD camera from a high resolution plot of the particle size distribution profile (and changes therein in time). Aggregation and flocculation are immediately apparent. This particle-by-particle approach avoids the ensemble assumptions of dynamic light scattering (DLS) and provides a unique image, going beyond light scattering in assessing polydisperse systems and providing insight into aggregation.